We want to take a minute to thank you one more time for participating in Extra Life and making miracles happen for families who desperately need them. Please know that you spent 2017 making a difference in the lives of so many families throughout North America. While we won't have the final fundraising total for the year to share with you until March, we're beyond thrilled to announce that so far, together we have raised over $10.6 million for the kids treated at Children's Miracle Network Hospitals! That is a huge accomplishment! Join us for another year of playing games to heal kids, sign up for Extra Life 2018. 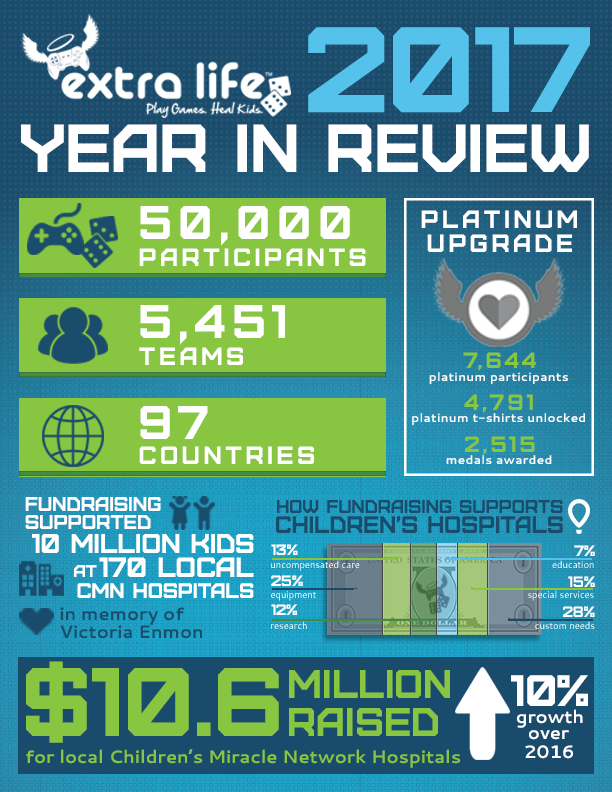 The Extra Life community has been coming together in a truly wonderful way year after year. Sign up for Extra Life 2018 today to continue to make a difference in the lives of sick and injured kids across North America. Let’s all keep that energy going by pushing forward for fun, fellowship, and – as always….